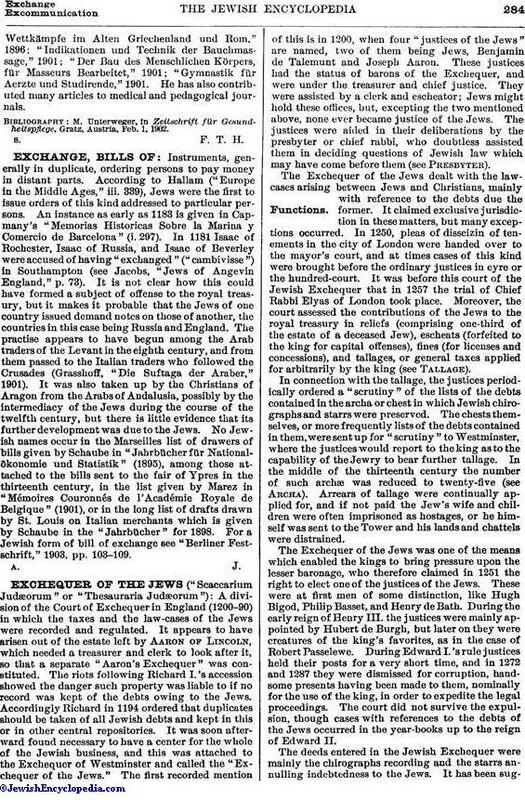 A division of the Court of Exchequer in England (1200-90) in which the taxes and the law-cases of the Jews were recorded and regulated. It appears to have arisen out of the estate left by Aaron of Lincoln, which needed a treasurer and clerk to look after it, so that a separate "Aaron's Exchequer" was constituted. The riots following Richard I. 's accession showed the danger such property was liable to if no record was kept of the debts owing to the Jews. Accordingly Richard in 1194 ordered that duplicates should be taken of all Jewish debts and kept in this or in other central repositories. It was soon afterward found necessary to have a center for the whole of the Jewish business, and this was attached to the Exchequer of Westminster and called the "Exchequer of the Jews." The first recorded mention of this is in 1200, when four "justices of the Jews" are named, two of them being Jews, Benjamin de Talemunt and Joseph Aaron. These justices had the status of barons of the Exchequer, and were under the treasurer and chief justice. They were assisted by a clerk and escheator; Jews might hold these offices, but, excepting the two mentioned above, none ever became justice of the Jews. The justices were aided in their deliberations by the presbyter or chief rabbi, who doubtless assisted them in deciding questions of Jewish law which may have come before them (see Presbyter). The Exchequer of the Jews dealt with the lawcases arising between Jews and Christians, mainly with reference to the debts due the former. It claimed exclusive jurisdiction in these matters, but many exceptions occurred. 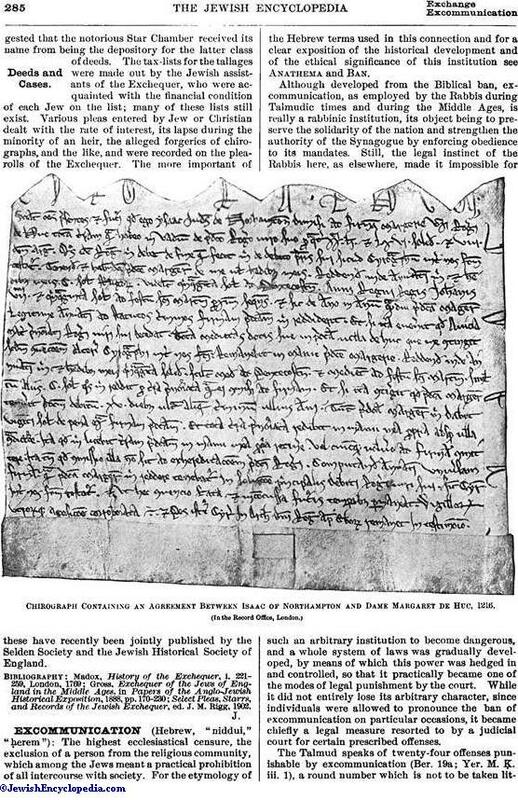 In 1250, pleas of disseizin of tenements in the city of London were handed over to the mayor's court, and at times cases of this kind were brought before the ordinary justices in eyre or the hundred-court. It was before this court of the Jewish Exchequer that in 1257 the trial of Chief Rabbi Elyas of London took place. Moreover, the court assessed the contributions of the Jews to the royal treasury in reliefs (comprising one-third of the estate of a deceased Jew), escheats (forfeited to the king for capital offenses), fines (for licenses and concessions), and tallages, or general taxes applied for arbitrarily by the king (see Tallage). In connection with the tallage, the justices periodically ordered a "scrutiny" of the lists of the debts contained in the archa or chest in which Jewish chirographs and starrs were preserved. The chests themselves, or more frequently lists of the debts contained in them, were sent up for "scrutiny" to Westminster, where the justices would report to the king as to the capability of the Jewry to bear further tallage. In the middle of the thirteenth century the number of such archæ was reduced to twenty-five (see Archa). Arrears of tallage were continually applied for, and if not paid the Jew's wife and children were often imprisoned as hostages, or he himself was sent to the Tower and his lands and chattels were distrained. The Exchequer of the Jews was one of the means which enabled the kings to bring pressure upon the lesser baronage, who therefore claimed in 1251 the right to elect one of the justices of the Jews. These were at first men of some distinction, like Hugh Bigod, Philip Basset, and Henry de Bath. During the early reign of Henry III. the justices were mainly appointed by Hubert de Burgh, but later on they were creatures of the king's favorites, as in the case of Robert Passelewe. During Edward I. 's rule justices held their posts for a very short time, and in 1272 and 1287 they were dismissed for corruption, handsome presents having been made to them, nominally for the use of the king, in order to expedite the legal proceedings. The court did not survive the expulsion, though cases with references to the debts of the Jews occurred in the year-books up to the reign of Edward II. The deeds entered in the Jewish Exchequer were mainly the chirographs recording and the starrs annulling indebtedness to the Jews. It has been suggestedthat the notorious Star Chamber received its name from being the depository for the latter class of deeds. The tax-lists for the tallages were made out by the Jewish assistants of the Exchequer, who were acquainted with the financial condition of each Jew on the list; many of these lists still exist. Various pleas entered by Jew or Christian dealt with the rate of interest, its lapse during the minority of an heir, the alleged forgeries of Chirographs, and the like, and were recorded on the plearolls of the Exchequer. The more important of these have recently been jointly published by the Selden Society and the Jewish Historical Society of England. Select Pleas, Starrs, and Records of the Jewish Exchequer, ed. J. M. Rigg, 1902.